If you have spent any time researching genealogy you have probably discovered at least one suicide in your family tree. Suicide is a tragic reality of many family histories. All too often though, the stories of those who take their own lives go untold. Every family deals with suicide in a different way. Some explicitly forbid any mention of the deceased. Others take a more subtle "don't ask don't tell" approach. Still others resort to outright fabrications that conceal the suicide from family lore. Whatever the case, those who have died by their own hands have stories. Their stories deserve to be told. The taboo against discussing suicide in family histories can be strong. As genealogists and historians we strive for accuracy. We owe it to our families to challenge this taboo so that our ancestors, and their struggles, are not forgotten. Here is one of those stories from my own family. This is John Rhoads (1886-1922). He is my 2nd great uncle. Some of these photos came from the family photo album of my great grandmother, Ida Rhoads Sears (1900-2002). John was one of her older brothers. 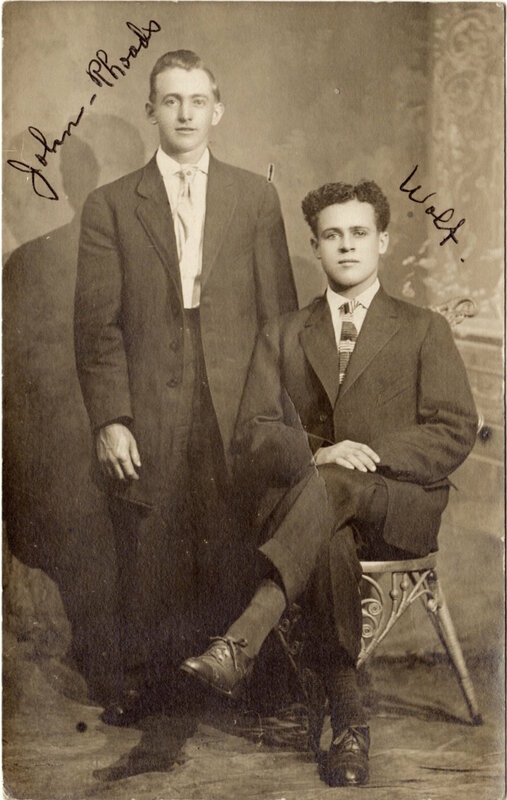 Here is another photo of John Rhoads with someone that my great grandmother could only identify as Mr. Wolf. John was married to a Sarah Wolfe in 1910. My best guess is that the Mr. Wolf in this photo is a brother of hers, i.e. John's brother-in-law. Here is John (far left) with several of the oldest of the 15 Rhoads siblings. I am guessing the photo to be taken around 1905. Finally, here is a picture of the entire (most of them at least) Rhoads clan. Some of the older sibling may not be in the picture. That is my great grandmother, the youngest in the center. I believe that is John on the far right. What do you think? John was born in Pennsylvania when his father, John M. Rhoads (1852-1919), was 33 and his mother, Mary Margaret (Costlow) Rhoads (1858-1947), was 27. John and his wife, Sarah, had two children between 1911 and 1917. John died at the young age of 36. His death was the result of a self-inflicted gunshot wound to the head. Officially the cause of death listed on the death certificate was: "Revolver bullet wound in head with suicidal intent." An article in the Pittsburgh Press from March 1, 1922 tells the sad story of his death. The article references three small children, but I have only been able to document two of them. Johnstown, PA. March 1. 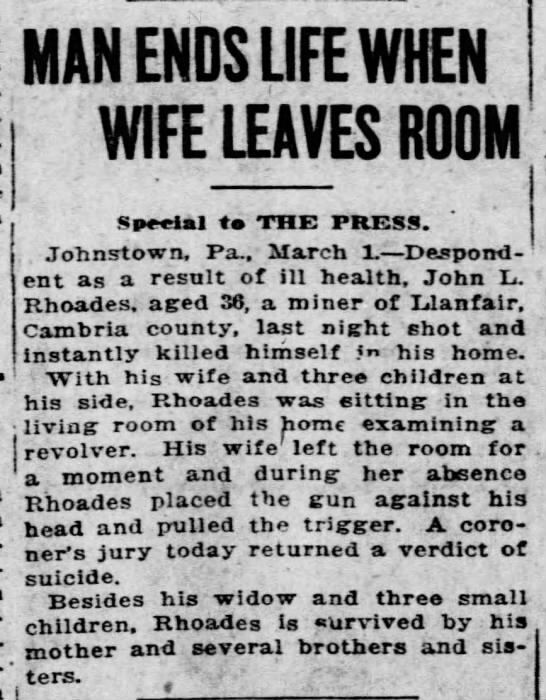 - Despondent as a result of ill health, John L. Rhoades, aged 36, a miner from Llanfair, Cambria county, last night shot and instantly killed himself in his home. 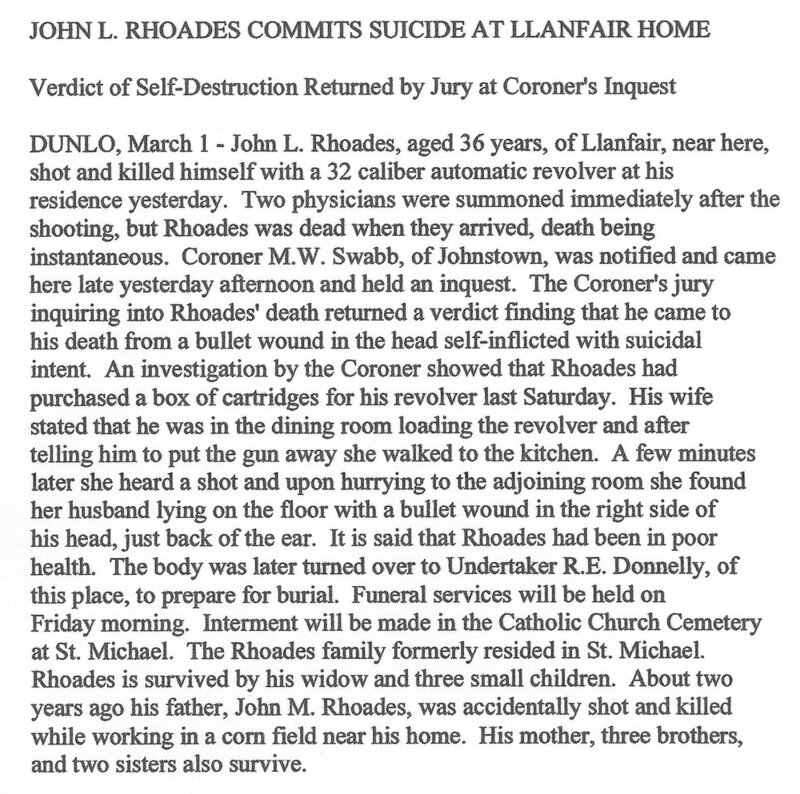 With his wife and three children at his side, Rhoades was sitting in the living room of his home examining a revolver. His wife left the room for a moment and during her absence Rhoades placed the gun against his head and pulled the trigger. A coroner's jury today returned a verdict of suicide. Besides his widow and three small children, Rhoades is survived by his mother and several brothers and sisters. A fellow ancestry.com contributor posted the following from a different newspaper, the Johnstown Tribune. I have not been able to find the original newspaper article, but this transcription appears to match most of the details from the first article. My great grandmother would have been about 22 when John died, and she lived to be 102. I knew my great-grandmother well into my own adulthood. I never once heard her, or anyone else in my family, mention this story. It was only when I started researching my family tree that I discovered it. There is much more to learn about John and the life that he lived. I have recently contacted a decendent of one of Sarah Wolfe's brothers. She has some interesting photos that I hope to go through to help tell more of the story. What were John's health issues? Did John have a mental illness like depression or anxiety? What did the family think, feel, and do in reaction to John's death? Was my great grandmother close to her brother? Why had I never heard about this before? What else can I learn about John and his family? Are there suicides or family secrets that you have discovered in your own family tree? What responsibility do you feel you have to either share or hide these details once discovered? There are no easy answers here, but I hope that in sharing John's story I've encouraged you to not forget the troubled souls in your own family. I hope you find a way to honor them. Do you like what you are reading here at The Psychogenealogst? If you do I would love for you to sign up for the email list below! Do you know someone who might enjoy it as well? Please consider giving it a share.